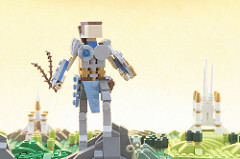 “Miniland” is the name of the area at LEGOLAND theme parks where master model builders have created landmarks and cityscapes. Built at a scale about twice as large as the size of models built for minifigs, the building style is also popular with LEGO fans who aren’t professional model builders themselves. 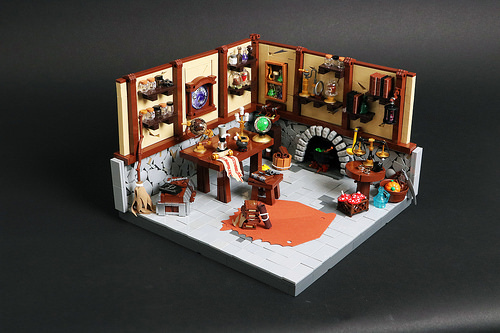 Enchantments, potions and magic! What else would one need? César Soares sure knows what is important in life – who cares about all that pointless real stuff, right? Joking aside, this is a pretty impressive creation. The builder says he has wanted to build in this scale for quite some time, and I can totally agree. Minifig utensils and the thicknesses of some bricks are often out of proportion with the minifigs they are made for, and that often looks very cartoony. This is not a bad thing on its own, but some times, it is nice to see more realistic Miniland scale creations like this one. I have said that this creation is impressive, and just being built in Miniland scale is obviously not enough to achieve that. The scene is filled with unique part usage, most notably cloth pieces. Just look at the broom and the unrolled scroll! 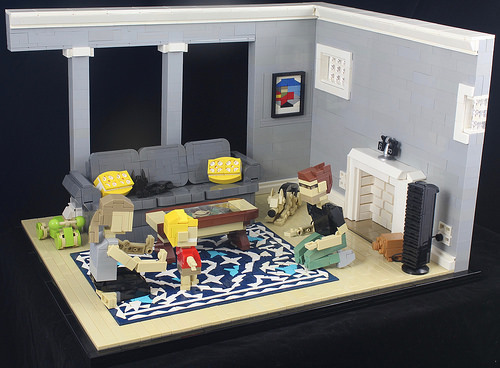 And still there is more to see, like legs of the chair and table that are tilted off right angles, clever use of the log minifig costume under the table on the right and the wall texture, which uses a technique most often seen as floor, due to how unstable it would be when set upright. I wonder what kind of magic César used to keep it in place! France is very, very good at cheese, fashion and wine—and occasionally at engineering autos. 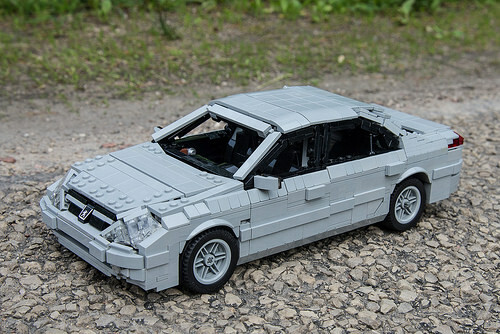 A legendary Peugeot 607 from the early 2000’s turned out to be good enough to merit being recreated with LEGO pieces somewhat 15 years later by Latvian builder Rolands Kirpis. If you’re a long-time Rolands fan, you’re likely used to his unique style of building which largely avoids curved slopes yet achieves a smooth look anyway. 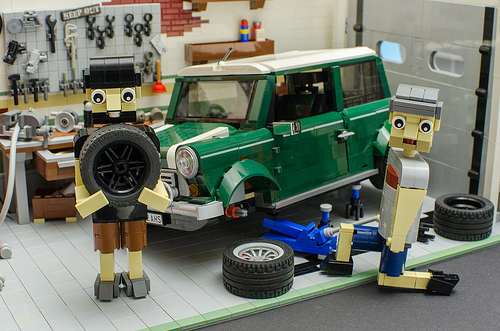 The scale of the car is similar to the famous Miniland vehicles, yet just a little bit bigger, giving more space in the design for smooth transitions and some neat touches like pretty accurate mud guards. 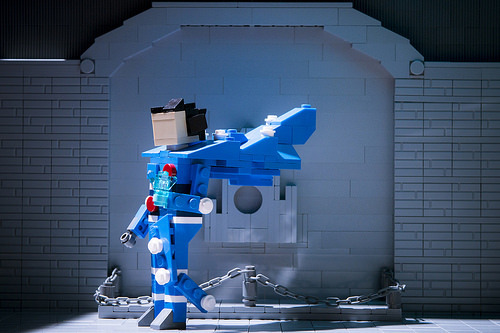 The brick-built nurse is clear enough as LEGO, but the room created by Kirill Simerzin begs a closer examination. 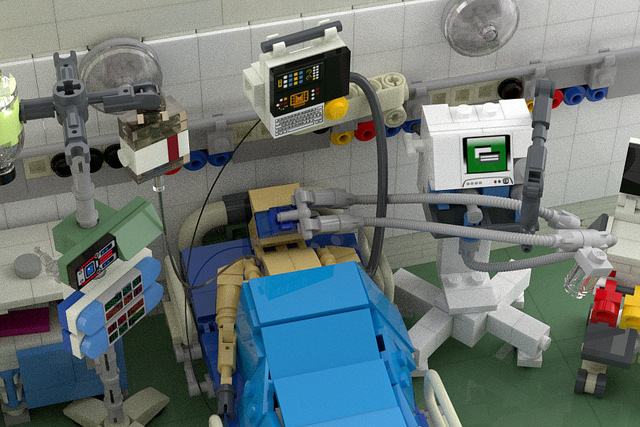 Overflowing with terrific details such as the slatted window blinds, IV drip, and power bed, you can almost hear the quiet beeping of medical devices in this rendered scene of an Intensive Care Unit. 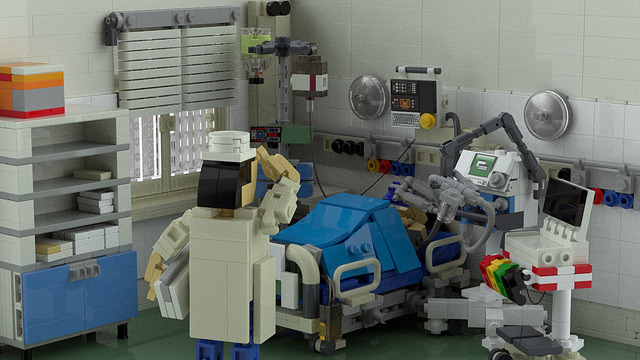 The larger miniland scale allows for lots of extra details missing from typical LEGO hospitals. 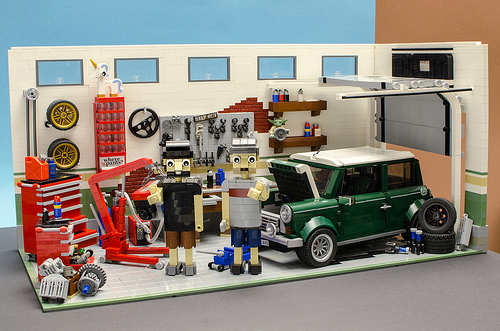 This fantastic service shop by _BrickBro_ will tune your official 10242 Mini Cooper to tip-top shape, with just a quick engine and transmission replacement. It’s got all the necessary tools and accessories to spruce up that evergreen hatchback, from replacement hubs to new steering wheels. Based on the popular youtube series Mighty Car Mods, the shop features hosts Marty and Moog walking viewers through their top-to-bottom restoration of this cult classic car. Who are we without our bricks? 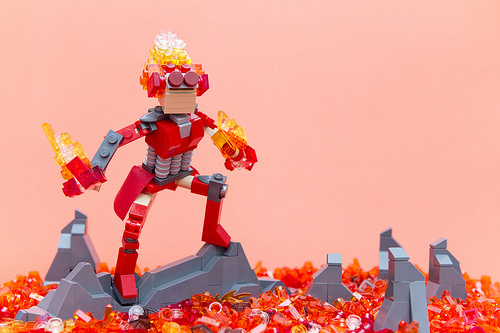 This is a question we all ask ourselves every now and then, but members of a Russian LUG took it a step further and built their life with and without the precious brick for a recent LUG building challenge. 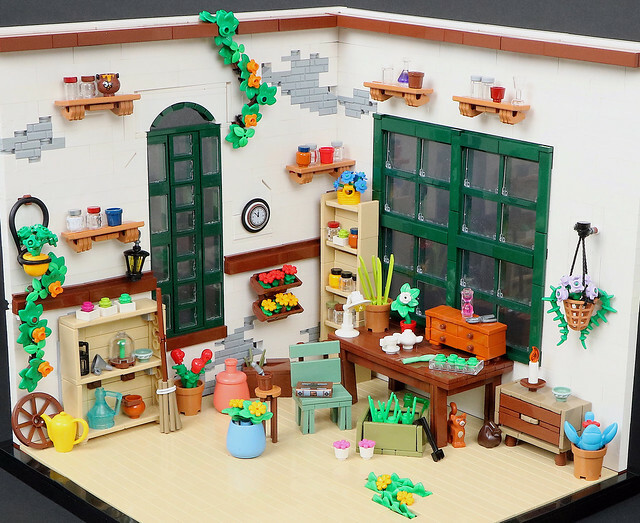 Over on the shelf, we see that Timofey Tkachev‘s home would probably be filled with a mineral collection if he didn’t have his LEGO hobby. 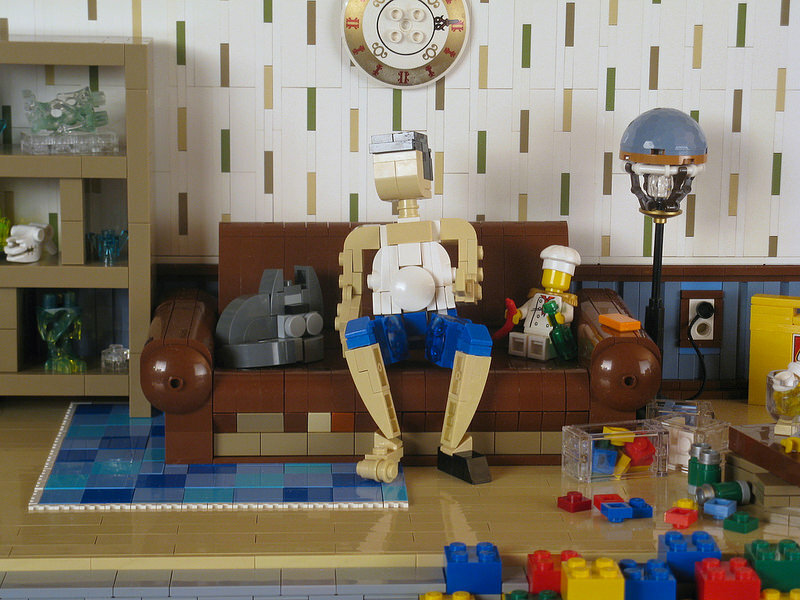 On the right we can see what Timofey guesses his apartment would like without LEGO to keep him grounded. There are lots of clever details to see on both sides, like the carpet’s edge and the LEGO shop bag nearly out of frame. The figure also references the builder’s previous creation, where we can compare what the builder fancies he’d look like with or without ABS. 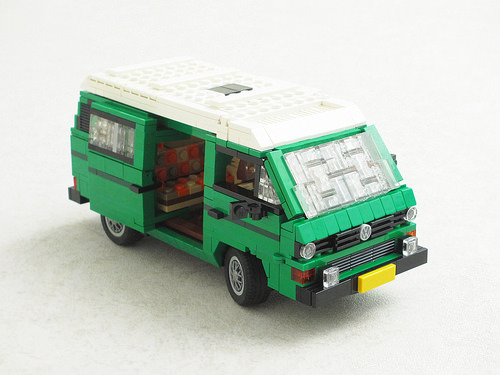 A year ago, we featured a series of autobiographical builds from Dave Kaleta. 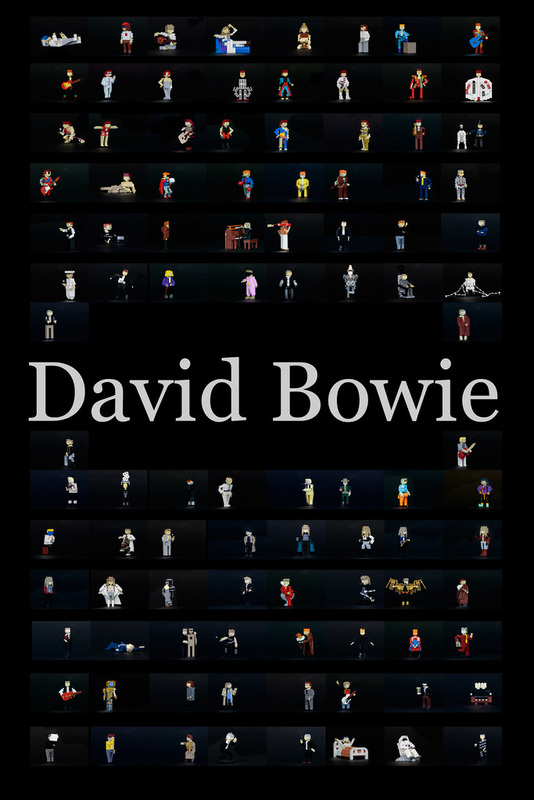 He’s recently shared the next step in his story, which he states took 6 months to create. Given that the next chapter in his story involves a small child in a crib, 6 months seems perfectly reasonable! There are some great things in this scene: mom’s posture flipping on the light, and the perfect fetal position of dad on the floor. 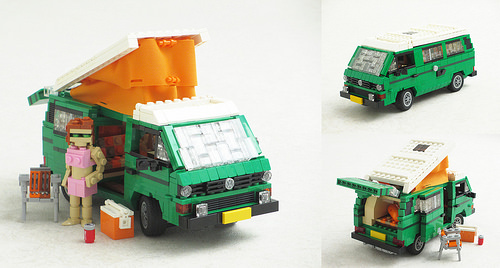 I think the 1×2 brick with the technic hole is inspired use for what I imagine is a chatty, energetic toddler. The Batman and Robin minifigs as toys are perfect at this scale! He’s been known by many names: The Mind Sculptor, Architect of Thought, Memory Adept, Telepath Unbound, the Living Guildpact, Unraveler of Secrets, and Vryn’s Prodigy. 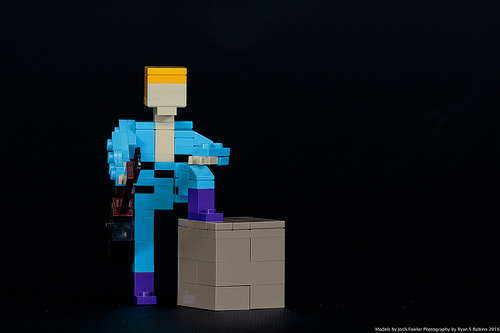 But now he needs a snappy LEGO-themed name because Magic: The Gathering fan Sergio just built Jace Beleren out of LEGO. 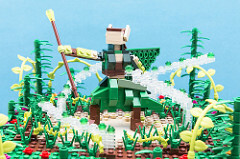 Built in the classic LEGO miniland scale, this LEGO creation is based on original artwork by Chase Stone. 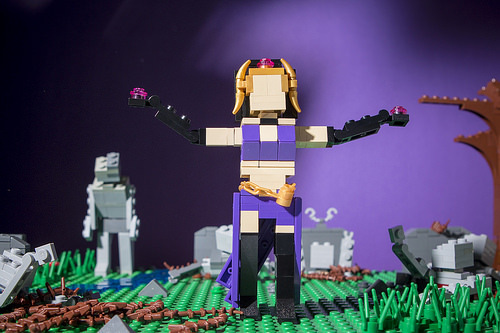 Sergio has also built the other members of the Gatewatch: the lovely necromancer Liliana Vess; the fire wielder Chandra Nalaar; the elven nature-mage Nissa Revane; and their commander the warrior-mage Gideon Jura. In addition to the great figures, the composition and lighting on these photos is simply phenomenal. Do you also practice the art of Irish Yoga? Every country has it’s stereotypes and when someone mentions Ireland, what are the first things that pop into your mind? Friendly, chatty, red headed, like a drink or three, plenty of siblings …but yoga gurus? 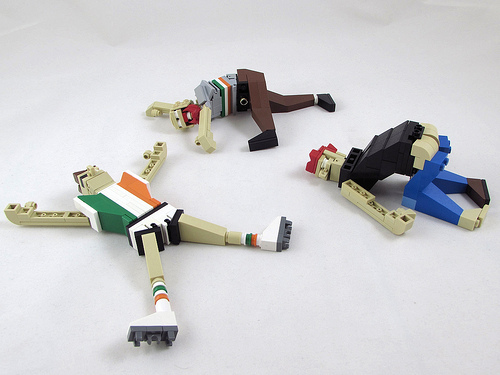 Well, these three Irishmen created by Matt Rowntree are all expert practitioners in the art of Irish Yoga. We have a passed out ‘mooner’ who has lost a shoe as well as his belt! Mid-celebration soccer fan who seems to have enjoyed a half-time tipple when his team won (or maybe lost, given that black eye). And finally my favourite, with an ingenious flaming red beard who thinks he’s still walking and socialising, judging by his relaxed position on the floor. The great thing about Irish Yoga is that it is all-inclusive. After a few celebratory drinks, we can all become masters in this ancient art.